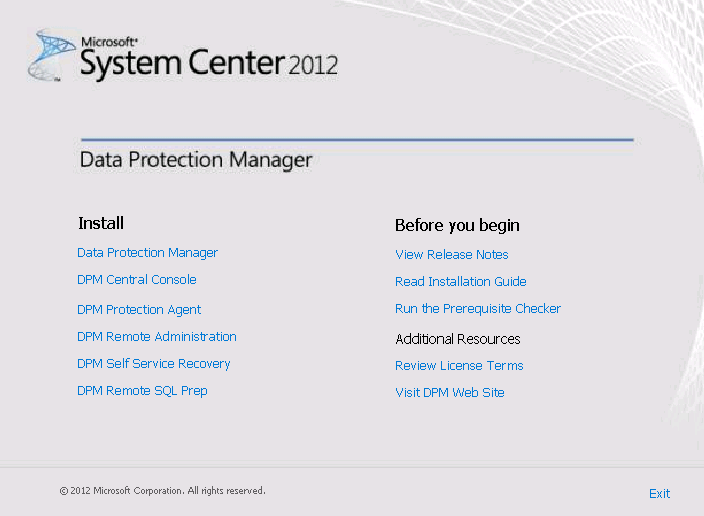 This is the first of many of System Center 2012 blog posts that I'm planning on writing over the next few months and I think it's only right that I start with one of the first System Center products that I began working with back a few years ago when it was System Center Data Protection Manager (DPM) 2007. This backup offering from Microsoft has come a long way since those heady days of being simply a 'Microsoft backup product for Microsoft products'! 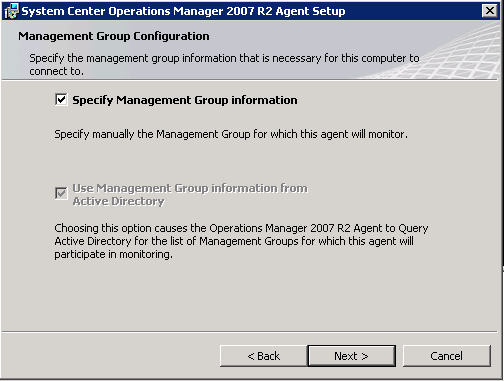 When I think back to the DPM 2007 application, I recall that, pre-Service Pack 1, it hadn't even got support for Hyper-V - although this was also in it's infancy in relation to where its at today! 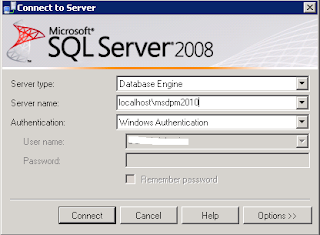 A few years back, the company I worked for - CDSoft - who have now been acquired by the company I currently work for - Ergo Group Ireland - built up our System Center skillset and practice by implementing DPM 2007 SP1 along with the new Hyper-V virtualization application that came with Windows Server 2008 RTM. 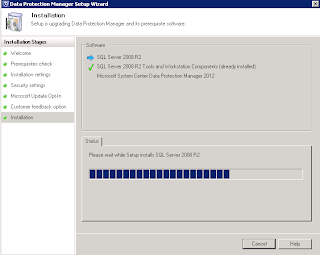 Although we found DPM 2007 SP1 to be an excellent brick-level backup product and a really good standalone Hyper-V host backup product, it was still lacking when Windows Server 2008 R2 came along with Failover Cluster support and Cluster Shared Volumes (CSV's). 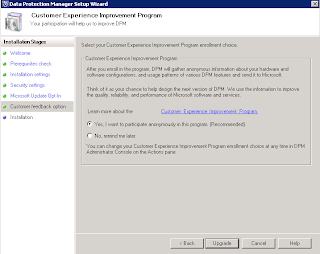 Late in 2009 we started hearing about DPM 2010 which had full support for Hyper-V R2 CSV's along with hardware based VSS snapshots and much better performance results. 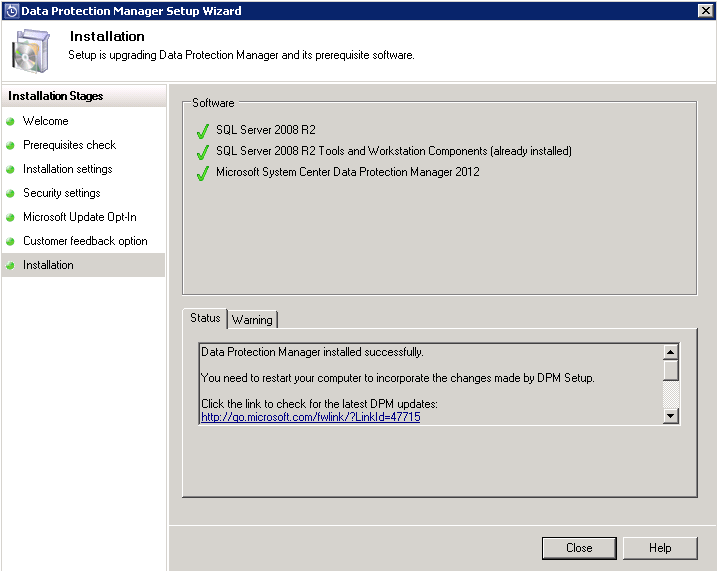 DPM 2010 is the most widespread and 'in-production ' version of Microsoft's backup offering and it's nearly a perfect fit for any Small to Medium Enterprise customers who have Hyper-V R2 installed in their environment - the type of customer that we see a lot of over here in Ireland! 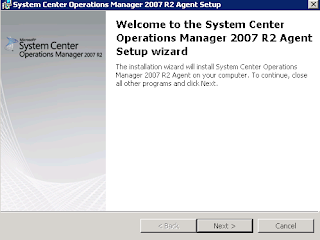 With DPM 2012, Microsoft have really improved on it's performance and extensibility, along with now having a really tight knit integration with the other System Center products- most notably System Center Operations Manager (SCOM). 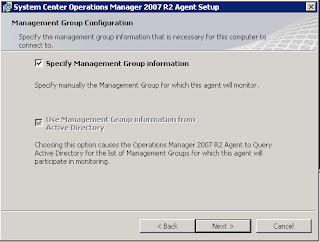 In the last couple of weeks I have found that it is possible to perform an in-place upgrade from DPM 2010 to DPM 2012 BETA to DPM 2012 RC to DPM 2012 RTM. 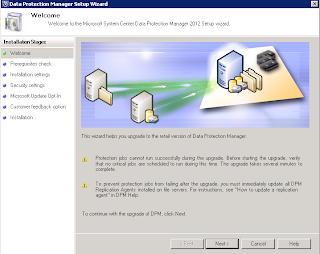 Microsoft don't support the upgrade to RTM from the BETA or RC releases but will of course support the upgrade of DPM 2010 to DPM 2012 RTM. 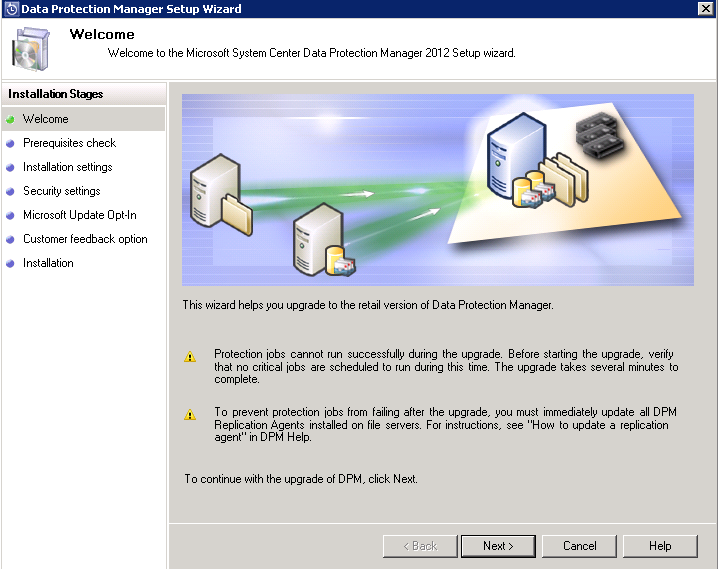 As a result of this upgrade path, the following few blog posts will offer a guide to upgrading an existing System Center Data Protection Manager 2010 installation that has active trusted and untrusted domain agents deployed, along with protection groups that are fully populated from a production environment. 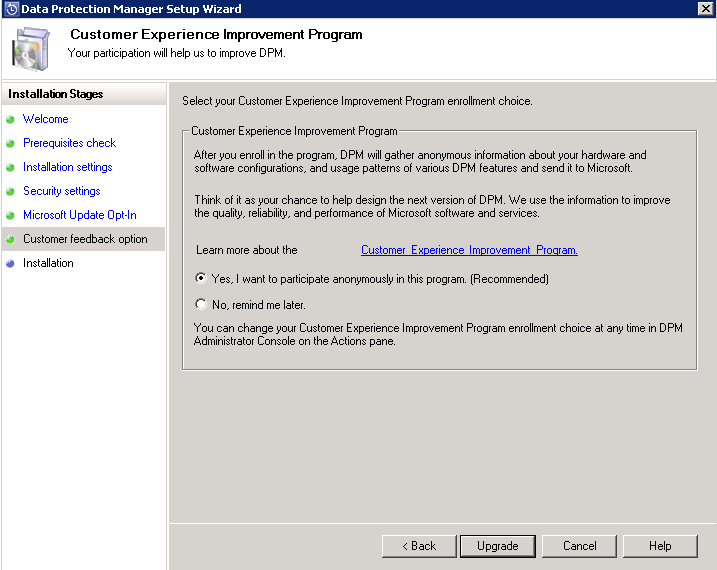 Edit Update May 2012: I've decided to update this post to reflect the upgrade process of DPM 2010 to the DPM 2012 RTM build as some of the references and screenshots to the BETA build - of which this series was originally written - are now defunct. 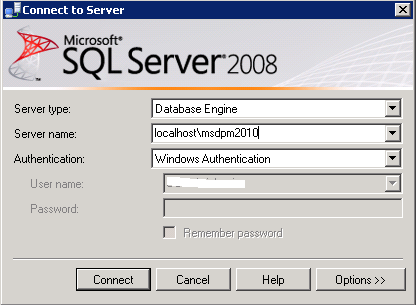 Before starting the actual upgrade, it’s always a good idea to take a backup of the DPMDB SQL database of your DPM 2010 server before beginning the DPM 2012 upgrade. In most instances, your DPM server is not going to be a virtual machine and as such, we have to revert back to the more traditional methods of ensuring we can recover if things don’t work out as planned with your upgrade! 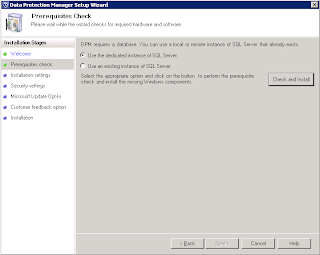 You can back up the DPM 2010 SQL database quickly using the SQL Server Management Studio to logon to the SQL instance. 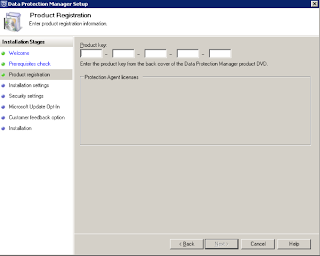 If you are upgrading an existing installation of DPM, the registry key for DS Collocation Factor is retained if it was modified by you and does not get reset. 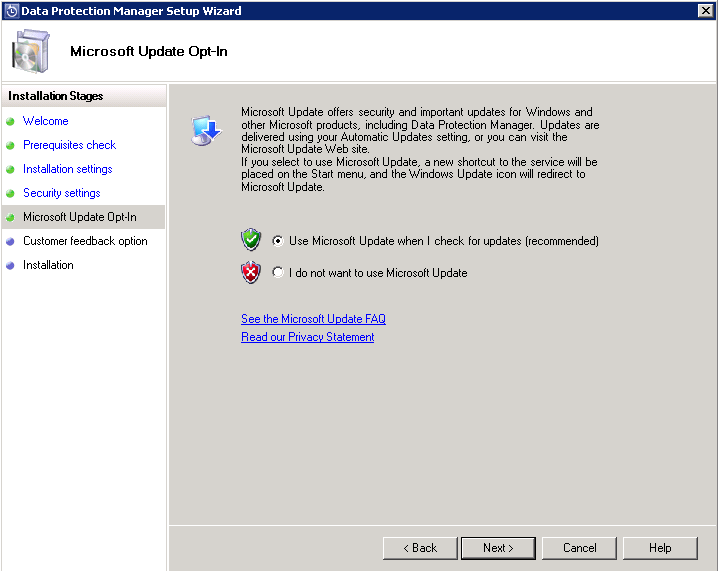 Click Ignore on any pop-up dialog boxes that appear during upgrade. 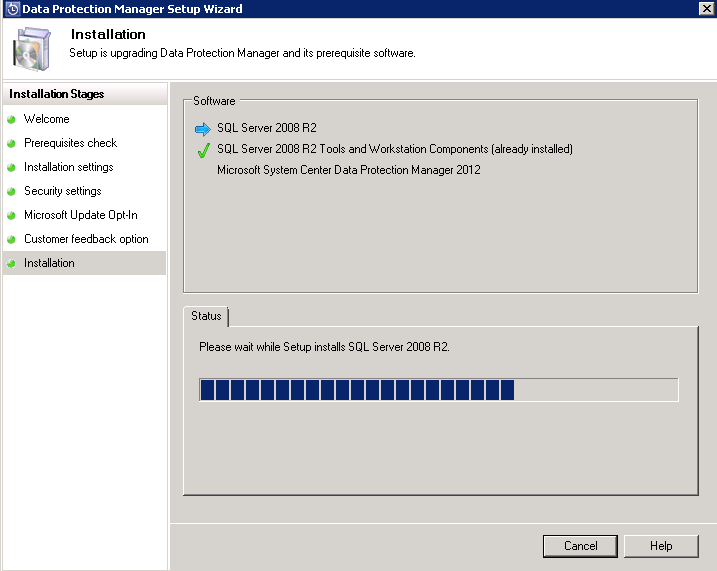 If your Express Full backups for SQL Server databases are transferring large amounts of data (almost the size of the primary MDF file), you must install the update KB2471430 on the SQL Server. This typically happens after you have run DBCC CHECKDB on a Windows 2008 server. 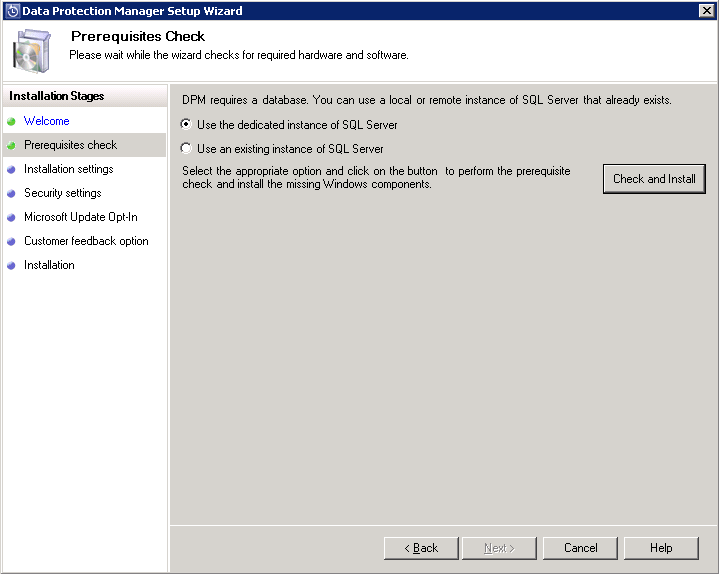 You MUST install the latest QFE rollup for DPM 2010 onto all of your DPM 2010 servers first and then once the update has been installed, you must push out the update to your protected servers that DPM 2010 is currently protecting. 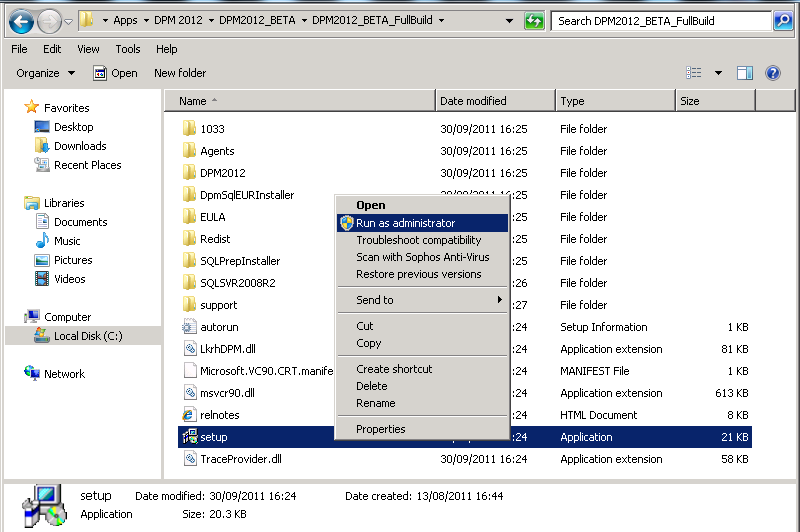 Extract the contents of the DPM 2012 zip file to a location on the C drive of your DPM 2010 server. 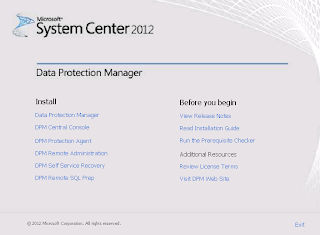 That will open the DPM 2012 splash screen as below. 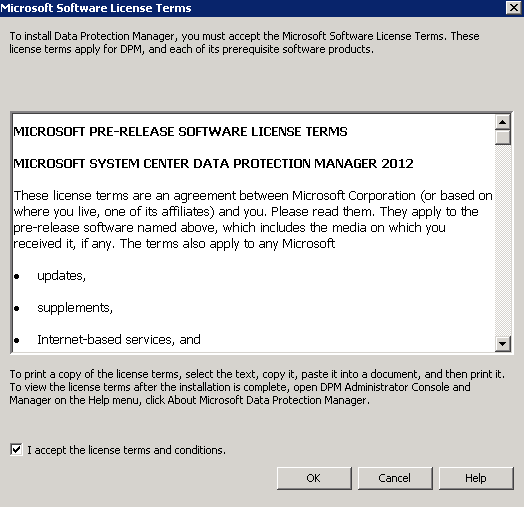 You can click on the ‘Run the Pre Requisite Checker’ option that will take you to a Technet article outlining all you need to know to confirm all your pre-requisites are in place for a smooth installation. 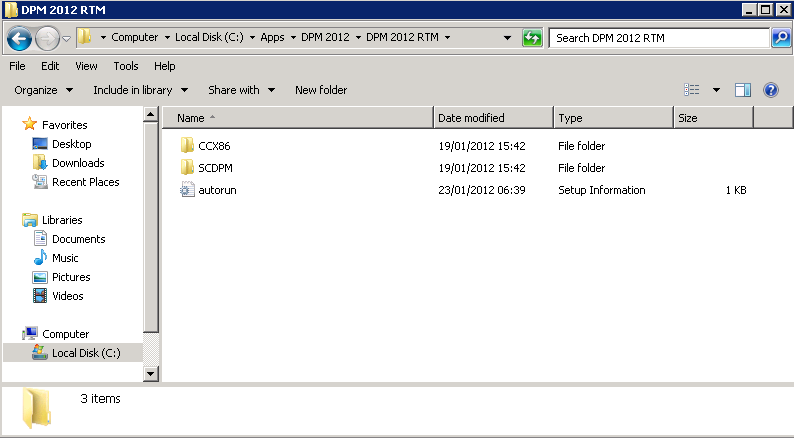 When your server has rebooted, you will notice that your DPM 2010 desktop shortcut has changed to a nice new DPM 2012 one!! In Part 2 of this short series, I will demonstrate what needs to be carried out to get your protected server agents - both trusted domain based and non-trusted domain based upgraded to the DPM 2012 agent files. I will also explain what needs to be done to ensure your existing protection groups are synchronized and fully up to date without having to modify or recreate them. 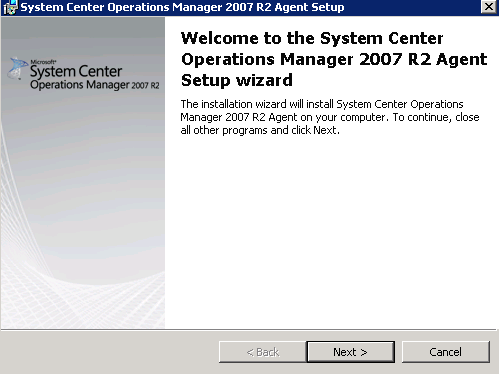 Got Windows Server 2008 or Windows 7 Client and want to play God? I came across this information a long time back but never got a chance to implement it until last night. 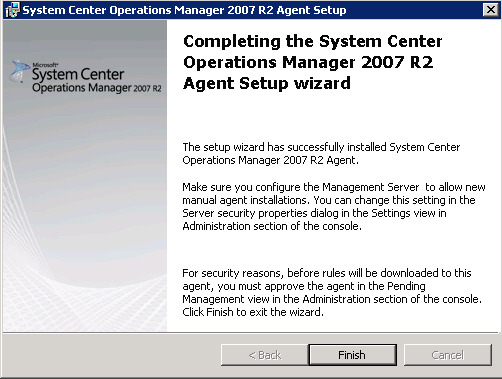 It's a quick hit way to gain 'God' like access to all of the administrative tasks that are available on your Windows Server 2008 or Windows 7 O/S. 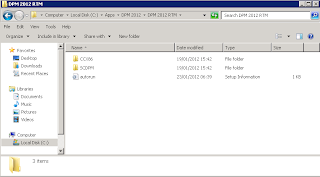 All you need to do is to firstly create a new folder on your Windows 2008 or Windows 7 desktop by right mouse clicking on a blank space and then selecting the 'New' and then 'Folder' flash out menu options. 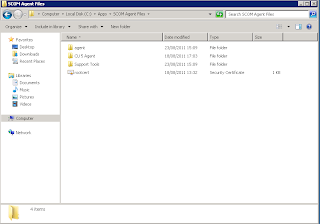 Once you have this new folder created, right mouse click on it and select the 'Rename' option. Now copy the text from the line below and rename your newly created folder with the exact text. Now when you double click on the 'GodMode' icon, you will see a huge list of links that allow you to do all sorts of administrative tasks! Now, I wonder if the same cheat would work for a Windows 8 O/S? 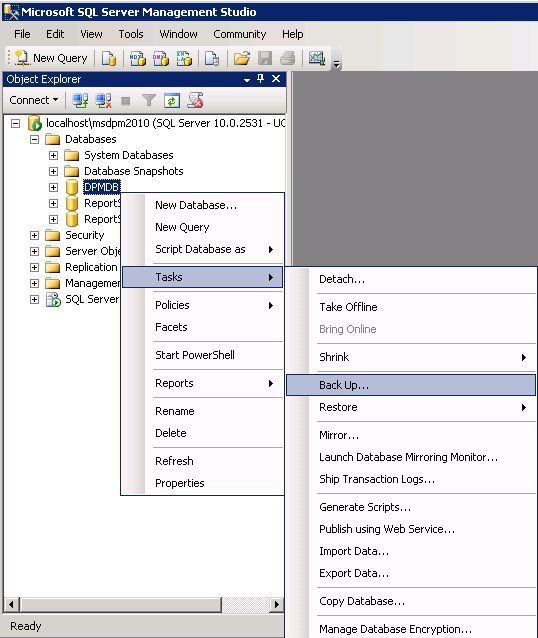 Bye, Bye CSV's, SAN's and Manufacturer NIC Teaming, Hello Windows Server 8!! Well, it's day 2 of the Build Windows conference in Anaheim, Calafornia and already the revelations about Microsoft's new operating systems - both Windows 8 client and Windows Server 8 - are coming fast and furious! The attendees who were lucky enough to be present there yesterday (unfortunately I'm not one of them) for the keynote speech by Microsoft's Steven Sinofsky were shown demonstrations of the power and efficiency of all the new features that the Windows 8 client comes with out of the box. Microsoft call it the 're-imagining of Windows'! Massive performance gains - includes full cold boot up in less than 8 seconds! To top yesterday's keynote speech and demonstrations off, all of the attendees got themselves a shiny new Samsung slate that comes with the Windows 8 client developer preview installed and ready to use!! In today's keynote speech they got down and dirty with Windows Server 8 which is going to be very relevant to my line of work and I really wanted to get a look at the new features released. The main Keynote speaker for day 2 is Microsoft's Satya Nadella and he is assisted throughout the speech by a number of other speakers including Jason Zander (Metro UI), Bryon Surace (Windows Server 8) and even a surprise apperance from Microsoft CEO Steve Ballmer! My primary interest from todays keynote speech was the Windows Server 8 demo's and I have to say, I wasn't disappointed from what I saw. OK, so the above new features don't mean the death of CSV's or SAN's but it was a nice tagline!! The new SMB 2.2 protocol allows VHD's to be mounted and run in Hyper-V from a simple file share UNC path, thus negating the pre-requisite for a Hyper-V cluster of needing shared storage. You can now 'Live Migrate' between two stand alone Hyper-V servers using file shares! It is worth noting though that without Shared Storage/Failover Clustering, you wouldn't have High Availability, which is one of the main benefits of clustering!! It is also worth noting now however, that your storage clustering Kung Fu doesn't need to be that strong any more to avail of the power of Hyper-V Live Migration - although any Hyper-V engineer would do well to know your iSCSI from your Fibre Channels and your MPIO's from your reservations! With Windows Server 8, we should see an end to my pet hate of manufacturer NIC teaming and the many disagreements I have with my workmates over Microsoft's cagey support of NIC teaming in a Hyper-V environment - particulary on the storage side of things! Finally, I've only touched the surface of what's been happening over in Build this week and if you want to get a blow by blow account of everything that's happening, then check out Aidan Finn or Hans Vredevoort's blogs as I've found them to be an excellent source of up to date info on what's coming out of the conference. Windows 8 officially confirmed with built-in Hyper-V! In anticipation of next weeks 'Build Windows 2011' conference, Microsoft have confirmed the rumours that the new Windows 8 client operating system will come with Hyper-V built-in as standard. 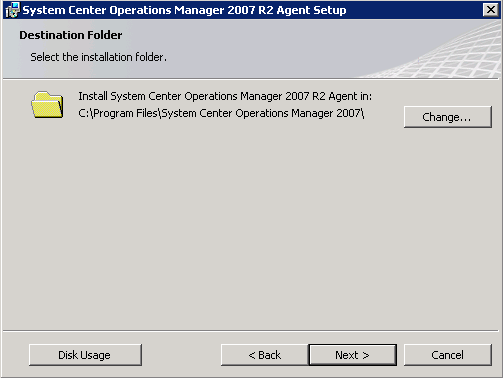 Those of you familiar with Windows Server 2008 Hyper-V will see a very familiar interface on the Windows 8 client when compared to the server based implementation. The challenge that MS had to overcome with building Hyper-V into a client O/S was that a lot of client O/S devices that will use Hyper-V would have Wireless NIC's. 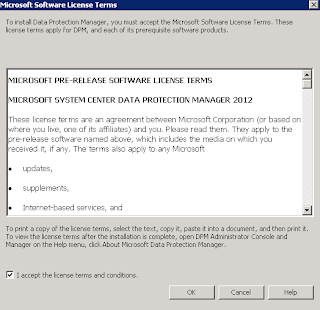 Microsoft have confirmed support for Wireless NIC's in Windows 8 and have provided an example video of it working. They have also demonstrated the new boot up speed which I calculated at close to 6 seconds from POST to Start screen!! 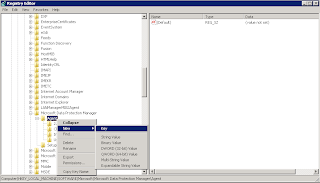 I came across an issue today where I wanted to use DPM 2010 to backup a number of virtual machines that were running on a non-clustered Hyper-V host but which had the HP P4000 Left Hand Hardware VSS Writer installed on it. 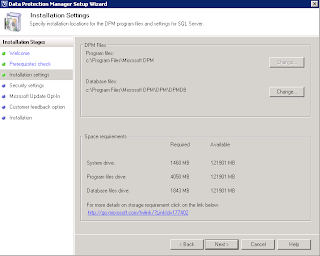 Description: The replica of Microsoft Hyper-V \Backup Using Child Partition Snapshot\-VMM2012 on VMHOST1-SRV. is inconsistent with the protected data source. 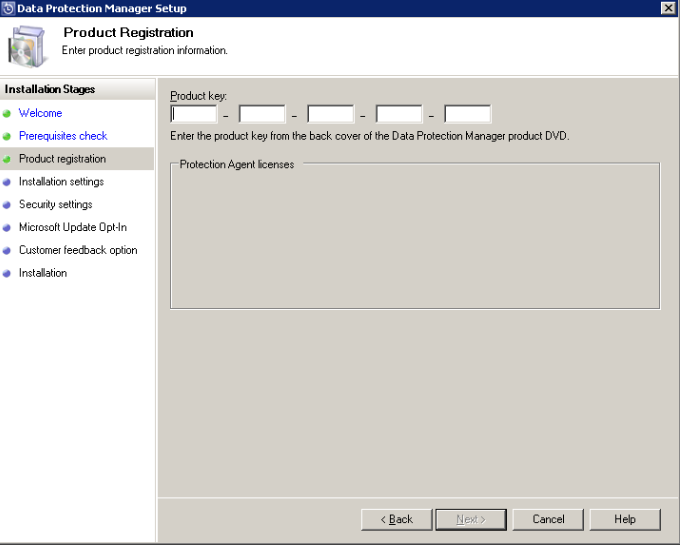 All protection activities for data source will fail until the replica is synchronized with consistency check. You can recover data from existing recovery points, but new recovery points cannot be created until the replica is consistent. Check recent records from the VolSnap source in the Application Event Log to find out why the problem occurred. Now at this point, I remember reading back when DPM 2010 was released that it would always default to try and use a hardware VSS writer if it was present on the Hyper-V host first instead of using the built in System VSS writer. This is by design and a pretty good design too in fairness as it is the best way to backup the VM's your CSV's in your Hyper-V cluster. I didn't want to have to go through the hassle of troubleshooting why the HP P4000 Left Hand hardware VSS writer wasn't working and I didn't want to uninstall it as we were using other volumes on that server that would need it. All I wanted was a quick way to backup the VM's using the built in System VSS writer in Windows Server and I decided to write up a quick blog post on it - as much for my own reference as anyone elses! 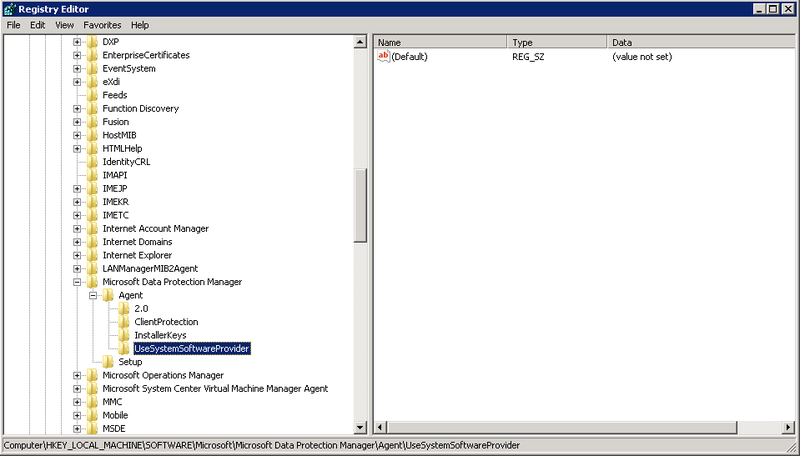 Logon to the Hyper-V host (or hosts) that you are trying to backup using the System VSS Writer with an administrative account. 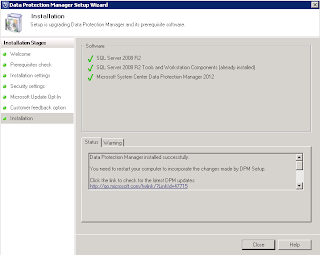 Once you have completed these simple steps, re-run or synchronize the DPM protection group that contains the virtual machines on the Hyper-V host you have just modified and it will complete successfully this time!! Make sure that if you want to use the System VSS writer on all of your Hyper-V hosts that you add the above registry key to each one. It is also worth noting that if you are not using a Hardware VSS Writer, then you will need to configure serialization of your Hyper-V backups, otherwise the virtual machine backups within each protection group will fail randomly due to lack of access to the Cluster Shared Volume. One final point to note is that this process is irrelevant if the Hyper-V host has no Hardware VSS writers installed in the first place as DPM 2010 will then just try to use the System VSS writer instead. 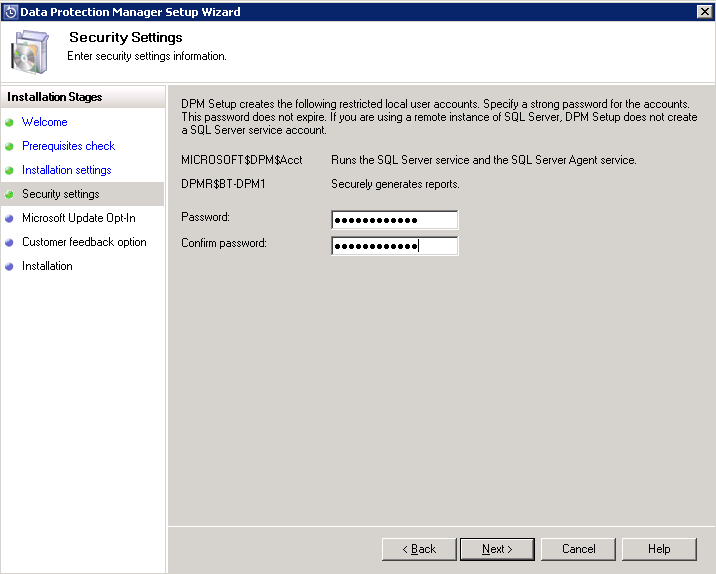 This is the final post in this 4 part series about 'Using Internal Certificates with SCOM on Windows Server 2008'. I recommend to read through the other 3 parts to this series first to ensure you have met all of the requirements needed to continue with the instructions contained in Part 4. 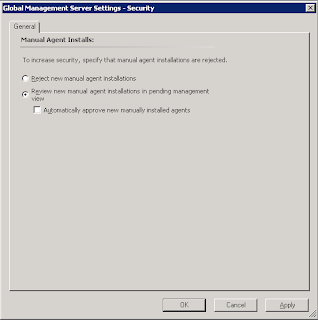 In this post I will detail how to manually install the SCOM agent, update it to the latest Cumulative Update 5 (CU5), and then how to import the certificate into SCOM for PKI authentication of your untrusted domain / DMZ or SCOM Gateway server. 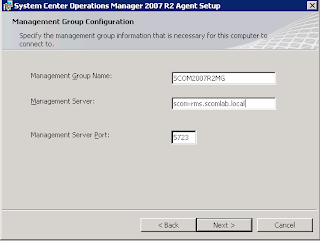 Once you have decided on your manual agent installation policy, log on to the computer in the untrusted domain / DMZ that you want SCOM to monitor with an account that is a member of the ‘Local Administrators’ group. 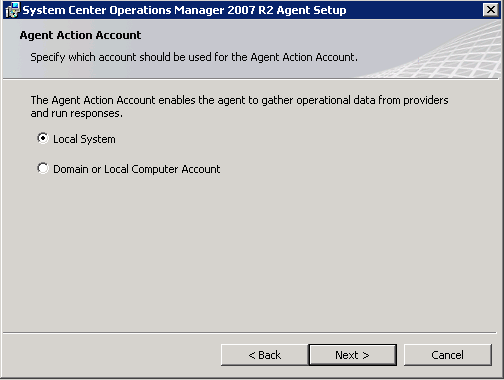 The SCOM agent needs to be manually installed on the server/computer that you wish to monitor before you can import the certificate into SCOM. 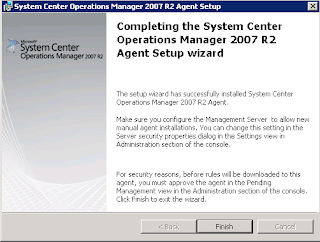 To install the SCOM agent, create a folder on the C drive of the server to be monitored called something like ‘SCOM Agent Files’ and ensure you have copied the SCOM Agent installation folder from the original SCOM installation media here. 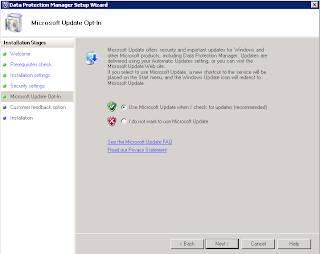 You will also need to copy the SCOM Agent update folder from the latest Cumulative Update version 5 (CU5) download to the server as the original SCOM agent installation will need to be upgraded to CU5 before you bring it into SCOM. 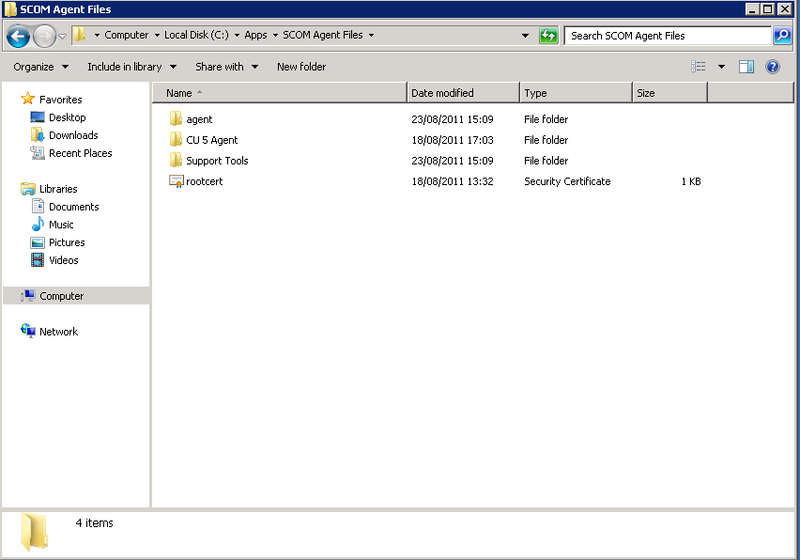 Finally, you will need to copy the ‘Support Files’ folder from the original SCOM media to the ‘SCOM Agent Files’ folder that you created from the previous paragraph as this folder contains the ‘MOMCertImport.exe’ utility that is needed to import the certificate once the agent has been manually installed and updated to CU5. 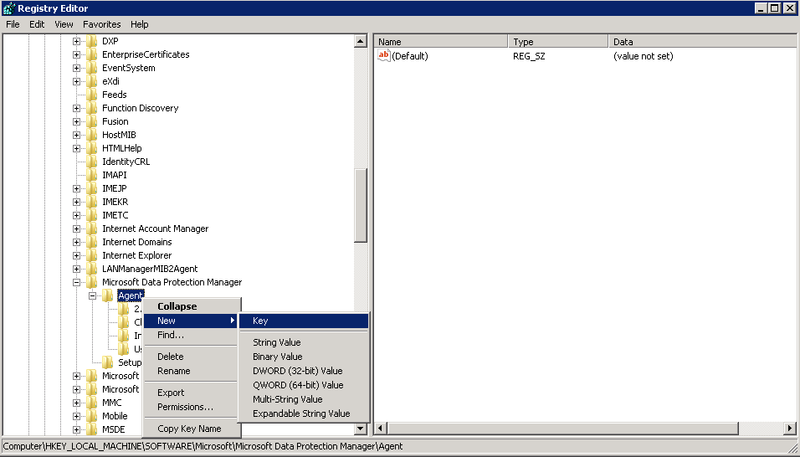 Once the folders above have been copied to the local C:\ drive of the untrusted domain / DMZ server that you want to bring into SCOM, then open up a command prompt with Administrative privileges to continue. 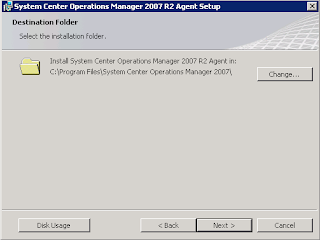 Using the command line, browse to the AMD64 folder within the original SCOM installation ‘Agent’ folder (or the i386 folder if you are installing onto a 32Bit O/S) and run the ‘MOMAgent.msi’ installer to begin the installation. 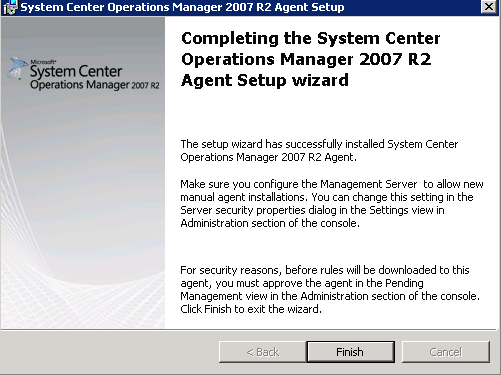 Click on the ‘Install’ button from the final screen to install the SCOM agent from the original installation media. 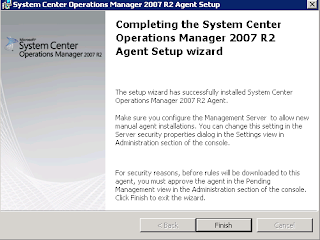 That completes the installation of the SCOM agent and also the upgrade of the orginal SCOM agent to CU5. All that's left to do now is to import the certificate into SCOM that was issued by the internal Certificate Authority to the untrusted domain / DMZ or SCOM Gateway server using the 'MOMCertImport.exe' utility. 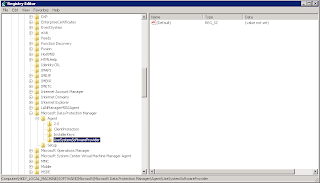 Now open up a command prompt with Administrative privileges and browse to the location that you have copied the ‘Support Tools’ folder from the original SCOM media. 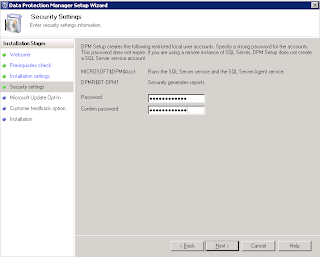 This should be all you need to do to get the untrusted / DMZ or SCOM Gateway server communicating with your SCOM Management Server using internal certificates. 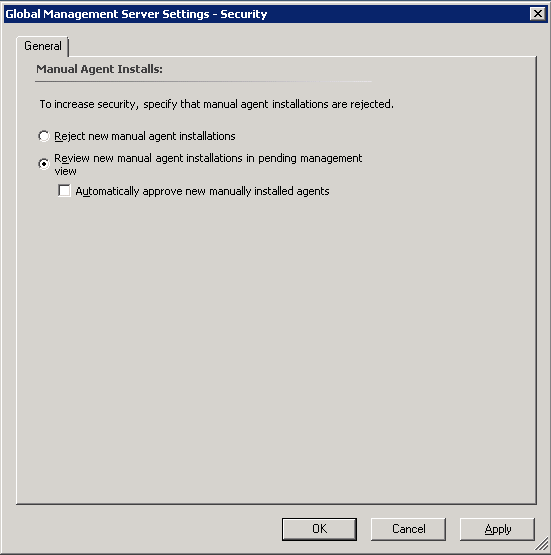 If there is any issues with the agent not becoming active within the ‘SCOM Agents’ window, make sure you don’t have the ‘Reject New Manual Agent Installations’ option selected from within the SCOM ‘Administration tab (this has been described further back in this blog series). 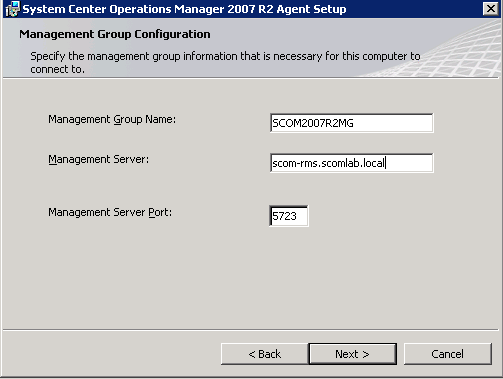 If you have allowed manual installation of the SCOM agents through the security settings and have followed everything in these posts correctly but the agent still doesn’t become active in SCOM, then it would be worth restarting the Health Service on firstly the untrusted domain /DMZ server and then secondly on the SCOM Management Server. This can sometimes be a final step needed to start the monitoring of your untrusted servers.